SEATTLE (AP) No. 12 Washington has lost another significant piece of its offense with freshman tight end Hunter Bryant expected to be out indefinitely after suffering a left leg injury in last weekend’s victory over UCLA. 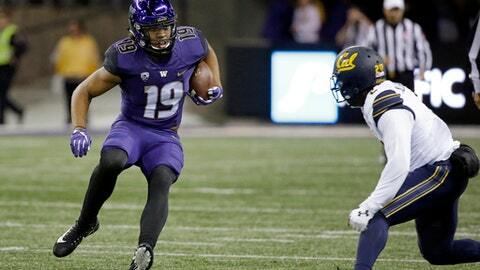 Washington coach Chris Petersen said Monday that doctors are still determining the final diagnosis for Bryant’s injury. Petersen typically does not announce injuries unless the player is likely to miss the rest of the season. Washington already lost starting left tackle Trey Adams (knee) and wide receiver Chico McClatcher (ankle) to season-ending injuries. After a sluggish start to the season, Bryant had 20 receptions and one touchdown in the past six games and had developed into a solid second pass-catching option for the Huskies to complement leading receiver Dante Pettis. Bryant’s breakout game came against California when he had nine catches for 121 yards and a score. Bryant was hurt on his lone catch against the Bruins, a 17-yard reception to the 1-yard line. Bryant was hit on the left leg as he appeared to be leaping for the front pylon at the goal line. Bryant was helped off the field by trainers and was putting little weight on the leg. ”I think his foot was in the ground. He didn’t quite get out of the ground and get into the air before he got hit,” Petersen said. The Huskies are likely to rely more on Will Dissly and Drew Sample as their tight ends with Bryant out. Petersen also said that cornerback Byron Murphy is getting closer to returning following a foot injury that has kept him out since late September, but would not say when he expects Murphy to be back on the field.